2010 ( FR ) · French · Documental · G · 51 minutes of full movie HD video (uncut). 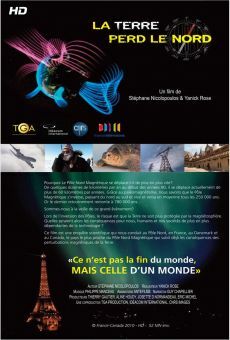 You can watch La Terre perd le Nord, full movie on FULLTV - Why the North Magnetic Pole is moving and going so fast? The Magnetic Pole is reversed periodically from north to south and vice versa once every 250,000 years on average. However last investment was 780,000 years ago. During this change, the Earth would be protected by the magnetosphere. This would have dire consequences for humans and animals that use magnetism to know his whereabouts, for nature in general and for our technology -dependent society. You are able to watch La Terre perd le Nord online, download or rent it as well on video-on-demand services (Netflix Movie List, HBO Now Stream), pay-TV or movie theaters with original audio in French. This film was premiered in theaters in 2010 (Movies 2010). The official release in theaters may differ from the year of production. Film directed by Stéphane Nicolopoulos and Yanick Rose. Screenplay written by Stéphane Nicolopoulos. Soundtrack composed by Philippe Manceau. Film produced and / or financed by Coproducción Francia-Canadá; TGA Production, CNRS Images and Idéacom International. As usual, the director filmed the scenes of this film in HD video (High Definition or 4K) with Dolby Digital audio. Without commercial breaks, the full movie La Terre perd le Nord has a duration of 51 minutes. Possibly, its official trailer stream is on the Internet. You can watch this full movie free with French or English subtitles on movie TV channels, renting the DVD or with VoD services (Video On Demand player, Hulu) and PPV (Pay Per View, Movie List on Netflix, Amazon Video). Full Movies / Online Movies / La Terre perd le Nord - To enjoy online movies you need a TV with Internet or LED / LCD TVs with DVD or BluRay Player. The full movies are not available for free streaming.